This tapestry "Madonna And Child" shows a striking work portraying the Virgin Mary and Jesus. The work is modern in that it makes use of a stained glass appearance yet transforming it into a more abstract scene. The haloes can be seen around mother and child to represent their holy auras. The clothes of the baby seem to shimmer into the rest of the scene. The colors of royal blue, violet and crimson, representing power, forgiveness and passion, are surrounding the main subjects. 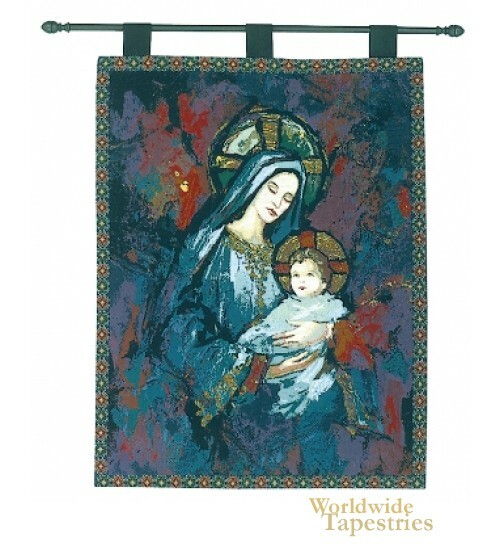 This Christian religious tapestry "Madonna And Child" is lined and has loops for easy hanging. Note: tapestry rods, where pictured, are not included in the price.